Originally published under the title "Turkey's 'Free' Press." Hurriyet columnist Ertugrul Ozkok (left) is under investigation for suggesting President Erdogan was responsible for Syrian migrants killed fleeing Turkey. 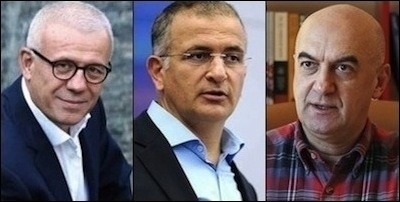 Zaman editor-in-chief Ekrem Dumanli (center) is alleged to have insulted Erdogan without naming him. Today's Zaman columnist Yavuz Baydar is under probe for implying Erdogan manipulates Turkish politics. In 2001, a group of Turkish Islamists broke off with their more hardline comrades and launched a "pro-reform, pro-Western, pro-European Union" (yet Islamist) party –the Justice and Development (AKP), promising to advocate universal values on human rights and democracy. In 2002, they rose to power and have since been ruling Turkey – despite a road accident they are now trying to fix after they lost their parliamentary majority in June 7 elections for the first time since 2002. New early elections are scheduled for Nov. 1. The AKP's election manifesto in 2002 firmly stated that: "Our party views law not as a means to frighten or punish but as a means to provide justice." Impressive. The AKP promised "a state of law and a justice system in compliance with the universal norms." What else? From the election manifesto: "State officials will be prevented from neglecting their responsibilities [by] referring to justice the work they ought to be doing." Turkey is ranked 149th in the 2015 RSF World Press Freedom Index. In 2002 it was 99th. In 2002, when the AKP promised universal freedoms to Turkey, the world's largest press advocacy group, Reporters Without Borders (RSF), ranked Turkey 99th on its World Press Freedom Index (out of 134 countries surveyed.) Nearly 13 years later, in February 2015, Turkey ranked 149th on RSF's list of 180 countries. Venezuela, Cambodia, Ethiopia, Myanmar, Zimbabwe, Afghanistan, the United Arab Emirates and Algeria performed better than Turkey, where, according to RSF, arrests and intimidation of journalists are rampant. The group said: "Turkey's 'underlying situation' score -- covering such areas as cyber-censorship, lawsuits, dismissals of critical journalists and gag orders -- actually worsened, showing that freedom of information continues to decline." AKP's leader, Recep Tayyip Erdogan, was elected president on Aug. 10, 2014. In the following 226 days a total of 236 people (more than one person per day), including minors and high school students, were investigated on charges of insulting the president. Turkey is increasingly becoming less safe for journalists as Erdogan's systematic campaign to intimidate goes at full speed. In the 226 days following Erdogan's 2014 election as president, 236 people were investigated for insulting him. Prosecutors recently launched a probe against Ertugrul Ozkok, one of Turkey's most prominent columnists (writing for Hurriyet daily). Ozkok is accused of holding Erdogan responsible for the death of a Syrian refugee child whose body washed ashore a Turkish holiday resort. Ozkok defended himself in a subsequent column: "I have not lost my sense so as to insult the country's elected President Erdogan by calling him a 'murderer.' Erdogan's name is not used in any line of my column." In Turkey you can be prosecuted for insulting the president whose name you never mention in your column. One day after Ozkok faced investigation, a prosecutor launched a probe into another journalist, Ekrem Dumanli, over accusations of insulting Erdogan during his remarks on a TV program. During the TV broadcast Dumanli mentioned "those who staged a military coup on Sept. 12, 1980, and referenced their violent and cruel implications over the people with different ideologies who faced ill-treatment and torture in prisons designed especially for political prisoners." The journalist said that no form of oppression is acceptable and that the public did its part to get rid of the threat even in times of military coups. Like Ozkok, Dumanli did not mention Erdogan's name during the broadcast. Prosecutors also have filed a case against Yavuz Baydar, columnist for Today's Zaman and Bugun daily, for insulting Erdogan in two of his recent columns published on Aug. 14 and 17. "I really have a hard time in understanding how they found an insult in these two columns which referred to the president as 'esteemed or honorable' but which is [also] used to mean 'mister' and which included a critical quote," Baydar said. "Being critical, questioning and warning is our professional responsibility. We shall continue to criticize. Just like many other colleagues who are investigated [on the same charge], there is no intention to insult in these columns but the right to criticize was used. I am saddened. I am concerned for our country and the media." Last year, Baydar received the European Press Prize for his efforts "to build trust in journalism." 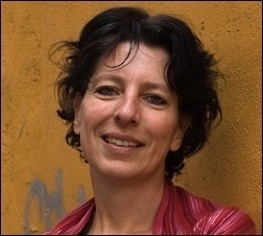 Dutch newspaper journalist Fréderike Geerdink was detained this month by Turkish police. And on Sept. 6 a Dutch journalist based in Turkey's southeastern Diyarbakir province, an overwhelmingly Kurdish city, was detained by the police for the second time. Fréderike Geerdink was detained at around 2 a.m., as she was following the election campaign of a pro-Kurdish party. "I am in custody in Yuksekova (town)," Geerdink tweeted. Geerdink was first detained in Diyarbakir in January on charges of "terrorist propaganda" but acquitted on those charges in April. Ironically, the Islamists often speak honestly when they are angry and not calculating the best ways to cheat. On Sept. 6, Hurriyet's newspaper's office in Istanbul was pelted with stones by hundreds of club-wielding Erdogan fans. Video footage shows an AKP member of parliament, Abdurrahim Boynukalin, leading the mob. In a fierce speech in front of the newspaper's building, Boynukalin vowed that the Dogan media company [which owns Hurriyet] will "get the hell out of Turkey" when Erdogan will have additional executive powers "whatever the electoral outcome on Nov. 1 will be." The AKP's 2002 election manifesto was not altogether wrong. Just one word was missing in it when it read: "Our party views law not as a means to frighten or punish but as a means to provide justice." It meant to say: "... to provide Islamist justice."